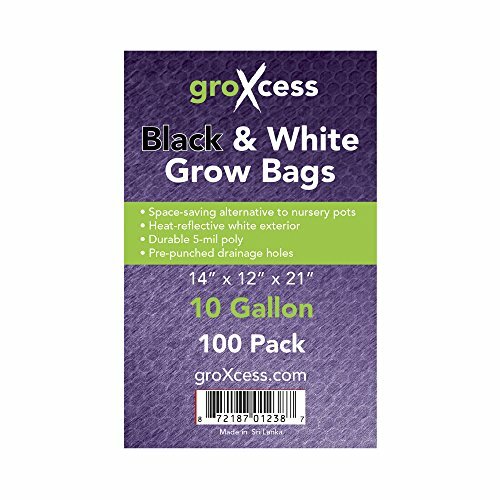 GroXcess Black & White Grow Bags, 100 Pack by GroXcess at Tulips Orchids. Hurry! Limited time offer. Offer valid only while supplies last. GroXcess® Grow Bags are black on the inside and white on the outside to reflect light back to plants while maintaining healthy root temperatures. GroXcess® Grow Bags are black on the inside and white on the outside to reflect light back to plants while maintaining healthy root temperatures. These UV-stabilized polyethylene bags are fluted, stand upright when filled with growing medium and have prepunched bottom holes for thorough drainage. Quart bags measure 3 inches by 3 inches by 7.5 inches. Pack of 100.